Great experience for both adults and kids. The rides, especially the sloped train, were amazing! The driver/tour guide and food were also very good. The ferry ride to the City with a bottle of beer was definitely a plus! 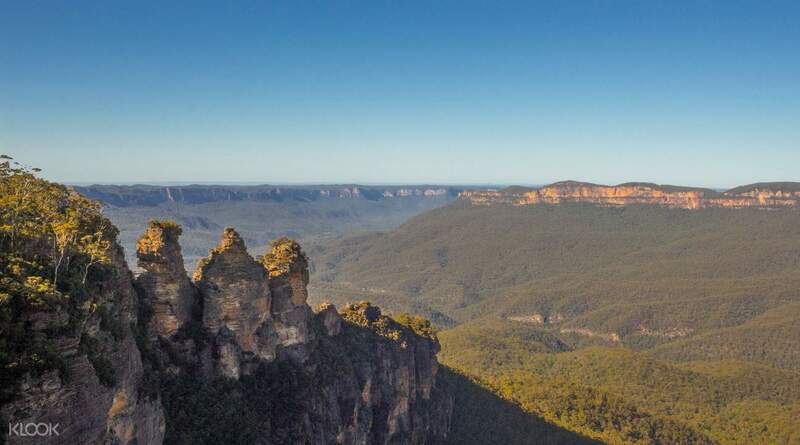 Travel to the amazing Blue Mountains in a comfortable mini-coach with this full day tour. The tour starts with a pick up from your hotel in Sydney, and from there you'll drive to your first stop of the day: Featherdale Wildlife Park. Brew a satisfying morning with Australia's diverse wildlife while enjoying a cup of tea. You might just get a chance to also hand-feed a kangaroo, wallaby or emu, or have close encounters with other animals including koalas! Head back to your coach, and en route, pass by the imposing Three Sisters - a fantastic photo opportunity. Afterwards, you'll visit Scenic World. 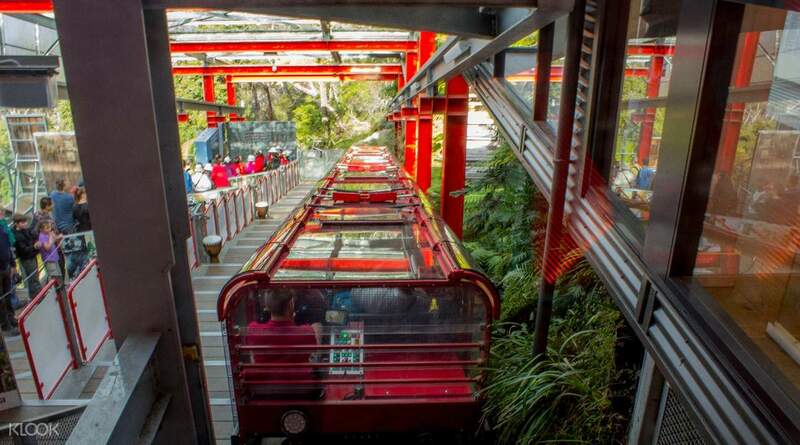 With your Unlimited Discovery Pass, ride the steepest incline railway down to the hidden valley - and then back out via a cableway for stunning panoramic views! 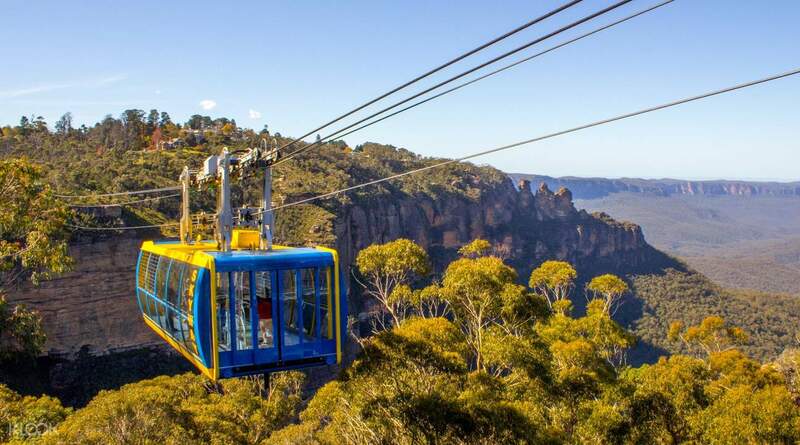 Make sure to ride the Skyway too and take in the ancient ravines and dazzling waterfalls. 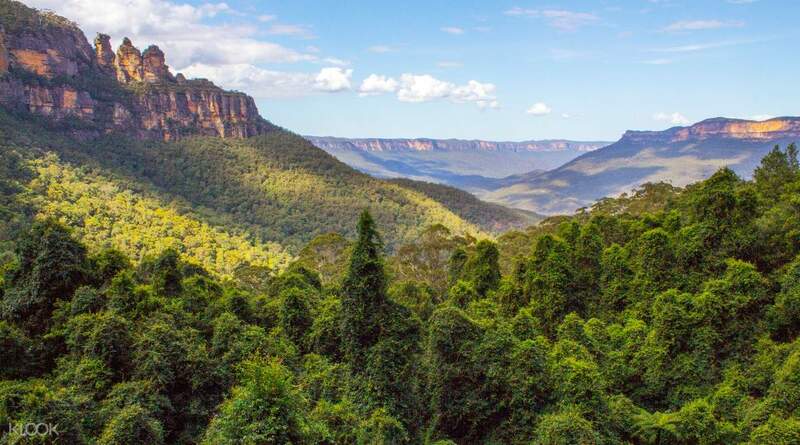 There, find yourself captivated by the beauty of the Blue Mountains, a World Heritage region filled with dramatic cliffs, deep canyons, and lush vegetations. Afterwards, head to Leura Garage to enjoy a heart lunch at this award winning restaurant located within the Blue Mountains. When you return to the city, you also have the option to escape the traffic and go on a relaxing cruise on Parramatta River, admiring waterside suburbs and fantastic scenery along the way. highlight of our sydney trip. was fortunate the clouds n showers cleared before my early afternoon scenic world tour began. we had a whole 2hr own time to walk around in scenic world which was awesome. took plenty scenic shots n countless rides. favourite had to be the world steepest ride. the kids loved the dino lost world walk. only sore was the lunch which we didnt like. too salty for us. highlight of our sydney trip. was fortunate the clouds n showers cleared before my early afternoon scenic world tour began. we had a whole 2hr own time to walk around in scenic world which was awesome. took plenty scenic shots n countless rides. favourite had to be the world steepest ride. the kids loved the dino lost world walk. only sore was the lunch which we didnt like. too salty for us. Wonderful trip. No question Blue mountain’s view are so impressive. Walk path is easy to access. My parent 70 years old can manage it. Suggest talk blue cable car, red then yellow. Wonderful trip. No question Blue mountain’s view are so impressive. Walk path is easy to access. My parent 70 years old can manage it. Suggest talk blue cable car, red then yellow. Great Commentary. It was very helpful. It was one of the highlights in our vacation. Such a nice experience for a day tour. We got a chance to encounter with wildlife animals, visit lookouts and rides in the scenic world, cruise in parramatta river. Great Commentary. It was very helpful. It was one of the highlights in our vacation. Such a nice experience for a day tour. We got a chance to encounter with wildlife animals, visit lookouts and rides in the scenic world, cruise in parramatta river. punctual at meetup point, easy to identify, the time allocated at the zoo is quite less but enough to cover kangaroo & koala unless you are animal fancy. we had our lunch at leura town, however the food there is tasteless, not nice, we found another restaurant is pack with ppl & they have variety of cheese and their menu look good to me. they had did what ever written in the itinerary.. punctual at meetup point, easy to identify, the time allocated at the zoo is quite less but enough to cover kangaroo & koala unless you are animal fancy. we had our lunch at leura town, however the food there is tasteless, not nice, we found another restaurant is pack with ppl & they have variety of cheese and their menu look good to me. they had did what ever written in the itinerary..
Henry, our driver and guide is extremely passionate about his profession. Very professional and explained everything in detail. The package could do with better lunch options. we had 5 lunch choices. I opted for the Thai curry lunch but was disappointed with it. Henry, our driver and guide is extremely passionate about his profession. Very professional and explained everything in detail. The package could do with better lunch options. we had 5 lunch choices. I opted for the Thai curry lunch but was disappointed with it. Weather was great, able to enjoy it fully. Suggest to take the red ride down to enjoy thrill experience. Weather was great, able to enjoy it fully. Suggest to take the red ride down to enjoy thrill experience. Thanks to Smokey, our tour guide. (Who I think, never stopped talking about trivias!!) Everything in the Itinerary was done!!! And he also let us have our time for picture taking. And the food is great! The whole day was awesome! Thanks to Smokey, our tour guide. (Who I think, never stopped talking about trivias!!) Everything in the Itinerary was done!!! And he also let us have our time for picture taking. And the food is great! The whole day was awesome! Staff didn’t call us to confirm the day before and when we tried to call the local providers we are not able to reach them. Finally we have to make international phone calls to enquire the position. The itinerary was a bit rush. Breakfast and lunch ok. Since there is a lot to do and the places is a bit far so it’s okay for the rush. Overall the tour is not bad. Staff didn’t call us to confirm the day before and when we tried to call the local providers we are not able to reach them. Finally we have to make international phone calls to enquire the position. The itinerary was a bit rush. Breakfast and lunch ok. Since there is a lot to do and the places is a bit far so it’s okay for the rush. Overall the tour is not bad. Pleasant drive away from city. Our tour bus driver John is very knowledgeable and friendly. He kept on sharing lot of stories and info abt the landmarks thru out the journey. The place, Leura garage, they dropped us for Lunch is very nice n food there r tasty. The town we had lunch is very beautiful and dreamy. However the trip is very rushing. We were Given only 1.5 hr to hv lunch n look around the beautiful town which isn’t enough for me who like to take pic around and 15min each for echo point and rest of the valleys. No time sit and rest except from ur lunch time. The trip itself is nice and given lot of experiences but not to enjoy coz too rushing. Pleasant drive away from city. Our tour bus driver John is very knowledgeable and friendly. He kept on sharing lot of stories and info abt the landmarks thru out the journey. The place, Leura garage, they dropped us for Lunch is very nice n food there r tasty. The town we had lunch is very beautiful and dreamy. However the trip is very rushing. We were Given only 1.5 hr to hv lunch n look around the beautiful town which isn’t enough for me who like to take pic around and 15min each for echo point and rest of the valleys. No time sit and rest except from ur lunch time. The trip itself is nice and given lot of experiences but not to enjoy coz too rushing.